Ready for Shipment: These Vacuum-Packed packets hold Open-Pollinated seeds from Seed Savers Exchange destined for backup storage at the Svalbard GLobal Seed Vault. Opened in 2008, the Svalbard Global Seed Vault is a steely compound tunneled 500 feet into an icy mountain in Spitsbergen, part of Norway’s Svalbard archipelago. Located just 800 miles from the North Pole, it’s intentionally difficult to find—and even more difficult to access—and it’s no exaggeration to say it may one day save the Earth from human extinction. To date, this highly remote, highly secure storage facility has accommodated nearly 1 million seed samples—including more than 3,500 from Seed Savers Exchange — in a globally-supported effort to safeguard biodiversity and, in very real terms, protect our food supply for future generations. Today it contains the most diverse collection of food-crop seeds in the world, stored in vacuum-packed silver packets (or test tubes) in a facility built to stand the test of time and the threat of natural or man-made disasters. Since Svalbard’s inception, Seed Savers Exchange and the United States Department of Agriculture (USDA) have been the only United States entities to contribute samples to the seed vault. And this February, just as it has done each winter since Svalbard opened its doors 10 years ago, Seed Savers Exchange once again packed up and shipped a selection of rare, heirloom, and open-pollinated seeds from its Heritage Farm headquarters in Decorah for deep storage at the ends of the earth. 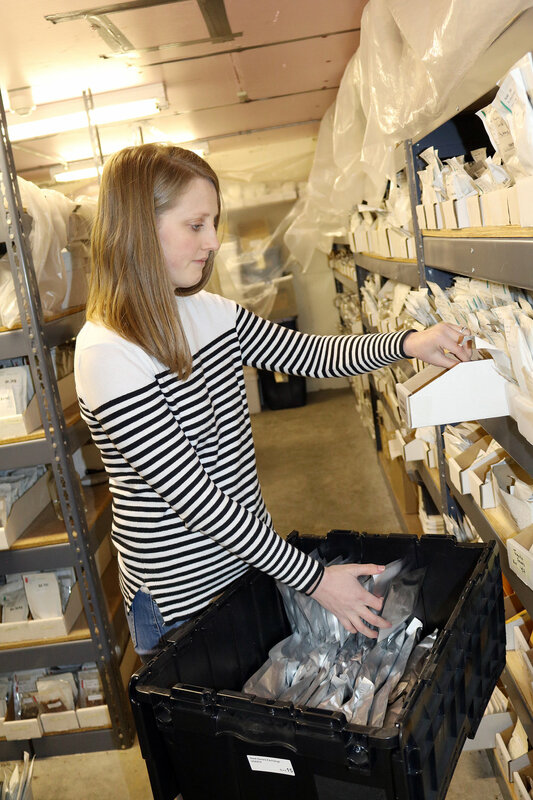 SSE staffer Molly Thompson packs the 242 varieties included in the 2018 shipment to the Svalbard Global Seed Vault. This year’s shipment from Heritage Farm includes 242 varieties representing 47 unique crop types. Among those varieties is the storied ‘Mostoller Wild Goose’ bean, donated to Seed Savers Exchange in 1981 by famed bean collector John Withee of the Wanigan Associates community of seed savers and gardeners. Withee received the variety in the late 1970s from Ralph Mostoller of Johnstown, Pennsylvania. According to family lore, Ralph’s great-grandmother, Sarah (Mowry) Mostoller, discovered the beans in the autumn of 1865 in the crop of a wild goose that her sons, John and David, had shot on the mill race of the family’s sawmill in Somerset County, Pennsylvania. The beans were planted the following spring and have been grown by subsequent generations of the family as a shelling bean and a dry bean. Also headed to Svalbard is ‘Grandma Einck’s’ dill, an heirloom herb grown near Festina, Iowa, since 1920 by the family of Katherine Einck, grandmother of Seed Savers Exchange cofounder Diane Ott Whealy. With large, fragrant heads and abundant, long-lasting foliage, this dill variety has long been a staple of Diane’s Garden, designed and maintained by Ott Whealy at the organization’s Heritage Farm headquarters. The self-seeding annual is popular with gardeners for both canning or fresh use. Heirloom 'Auntie Wilder' beans await packing for shipment to Svalbard. Yet another deposit—the sweet, tender, and juicy ‘Auntie Wilder’ bean—was introduced in the 2018 Seed Savers Exchange catalog, and its striking purple pods are already garnering attention from home gardeners nationwide. Dorothy Barnett of Shelton, Washington, received the high-yielding variety from her mother, who traces it to her nurse, “Auntie Wilder,” an immigrant who brought the seeds with her from Sweden in the 1890s. Packets of the variety are currently being shipped from Heritage Farm to growers across the country, awaiting sowing when the time and soil temperatures are right. Sharing these heirloom beans with both gardeners and the Svalbard Global Seed Vault doubles the effort to preserve them—the variety both lives on in perpetuity because it is being grown in gardens and also is safeguarded thanks to the protection afforded by Svalbard. The Svalbard Global Seed Vault was built in 2008 by the Norwegian government to store seed samples from countries around the world as an insurance policy against the loss of diversity due to natural disasters, the effects of war, and changes in global farming practices. Over the past 50 years, agricultural practices have changed dramatically, with technological advances allowing large-scale crop production. But while crop yields have increased, biodiversity has decreased to the point that now only about 30 crop types provide 95 percent of human food-energy needs. According to various estimates, the United States has lost up to 90 percent of its fruit and vegetable varieties since the 1900s, leaving food supplies dangerously susceptible to threats such as diseases and drought. These Labels are affixed to all black boxes from Seed Savers Exchange stored in the Svalbard Global Seed Vault. For more than 45 years, Seed Savers Exchange has worked hard to preserve and share the remaining varieties of rare, open-pollinated seeds and plants at its Heritage Farm headquarters. Today it maintains more than 20,000 of these varieties in its seed bank. Seed regenerations are done every year to ensure that the organization has enough viable seed in storage to protect the variety. If a regeneration produces sufficient seed for the organization’s immediate- and near-term needs, the extra seed is sent to Svalbard and/or the USDA seed vault in Fort Collins, Colorado, where it is stored free of charge. These backups ensure that if Seed Savers Exchange ever has a catastrophic problem with its seed bank, the collection is still protected. The deposits made at Fort Collins, as well as at Svalbard, remain the property of Seed Savers Exchange and cannot be distributed to third parties.